Editor’s note: Second Look is a new series based on Fred Bernstein’s regular column in Oculus, the quarterly magazine of the AIA New York Chapter. It is reprinted here with permission. Did architecture cause a Chinese food deliveryman to get stuck in an elevator in the Bronx – while rescue workers searched for him for days? The incident, which occurred in April, received plenty of tabloid coverage. But to set the scene, it helps to know that the building in question, part of the Tracey Towers complex on West Mosholu Parkway in the Bronx, was designed by Paul Rudolph with Jerald L. Karlan. And if Rudolph’s architecture didn’t cause the elevator to get stuck, it may have added to the subsequent confusion. Arriving at the front of the complex (completed in 1972), it is impossible to know where to enter; ramps lead to more ramps, which lead to chain-link fences blocking access to the building’s labyrinthine public spaces. The lobby level is really half a dozen levels, interconnected in ways that even an architecture writer can’t suss out. In private homes – including his own townhouse on Beekman Place – the complexity of Rudolph’s architecture was exhilarating. But in a complex with nearly 900 apartments, occupied mostly by immigrants, the effect is very different. It’s unlikely the residents think of the ramps to nowhere and interior cul de sacs as delights; they are instead dilemmas. The towers (among the tallest in the Bronx, at 41 and 38 stories) are clad entirely in Rudolph’s famed corduroy concrete. The material (actually tens of thousands of concrete blocks) is gorgeous – it’s rare for buildings this large to feel crafted. Norval White and Eliot Willensky unfairly described the buildings as “sand castles with overactive thyroids” in the AIA Guide to New York City. Up close, the concrete shows even deeper crevices than expected – as if the facades are palisades, deposited by geologic forces. The material makes the buildings seem shadowy even in broad daylight. The buildings’ other unmistakable Rudolph elements include floor plans that resemble palm fronds designed on a child’s Spirograph. The multiple curves make the buildings immediately recognizable as thoughtful works of architecture. 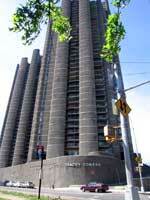 Several other New York towers – the 1987 Corinthian Apartments by Der Scutt and Michael Schimenti, on First Avenue and 37th Street, and the 1973 Lincoln Plaza Tower by Horace Ginsbern & Associates (where the corrugated bricks turn into fluted columns), at 44 West 62nd Street, are its compatriots, but in those cases the largest curves are made of glass. In Rudolph’s buildings the windows are flat, and the curves are entirely masonry, giving the buildings their almost primeval mien. The problem with curved buildings – always – is what to do with the spaces that result. 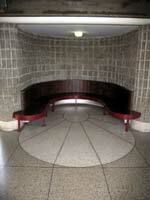 In several of Rudolph’s lobby areas, the curves are used to dramatic effect. A foyer leading from the parking garage to the towers is a kind of colonnade, with a barrel vaulted ceiling and half a dozen semi-circular seating bays (their geometry reinforced by radial patterns in the terrazzo). Despite the addition of tacky light fixtures, this is still one of the most striking interiors in the city, and one of the least known. It is Rudolph at his most expressive. But upstairs, Rudolph’s hand is nowhere to be seen. The apartments are entirely rectilinear. Square closets are shoe-horned into the curves, soaking up the residual space as best they can. A floorplan of the two-bedroom J apartment in the south tower shows an astonishingly phallic exterior projection completely hidden on the inside by wallboard meeting at right angles. How did Rudolph, a restless and challenging architectural mind, end up doing subsidized housing in the Bronx? According to Tim Rohan, a Rudolph biographer at the University of Massachusetts, Amherst, Rudolph was friendly with Ed Logue (president of the New York State Urban Development Corporation from 1968 to 1975 and president of the South Bronx Development Organization from 1978 to 1985). 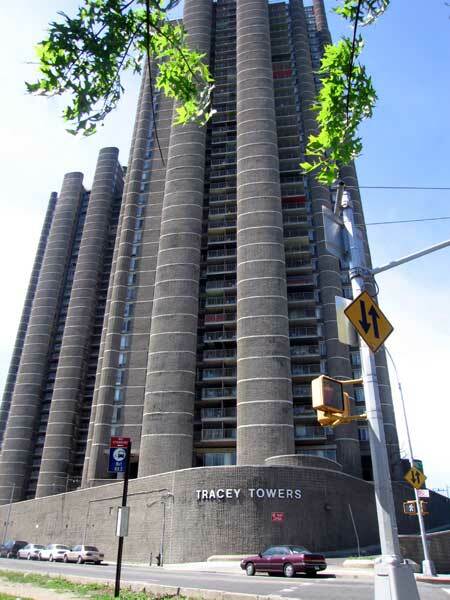 Tracey Towers were built in a time of optimism. Logue took chances on important architects. The results of that gamble are mixed. Fred Bernstein, an Oculus contributing editor, has written about design for more than 15 years. He also contributes to the New York Times, Metropolitan Home, and Blueprint. Op-Ed: The 2012 New York Olympics is lost. Long live the 2014 New York World's Fair. Queens, NY: Its power undiminished after 40 years, a 20th century cathedral to science is rediscovered along with a luminous new addition.